I'm reading a book at the moment called Human Traces and I came across a page that describes this motherhood malarkey so perfectly I wanted to share. "It was such a common human experience, thought Sonia - by definition, perhaps, the commonest of all; yet to each of them, she could see, it was a private rapture so intoxicating that they were forced sometimes to play at being blasé, to complain about the work, the sleepless nights, the loss of time alone, when she could see all they really felt was incredulity that something so mechanically natural was in truth so sublime. They were changed for ever, these women - changed by everyday transcendence that had lived through. She saw then stealing glances at their children on the grass or in the hall, rationing their gaze, hoping not to wear away the miracle by too much looking; but she did not mind that her own exultation was not unique; it reassured her to think that anyone might feel as she did." 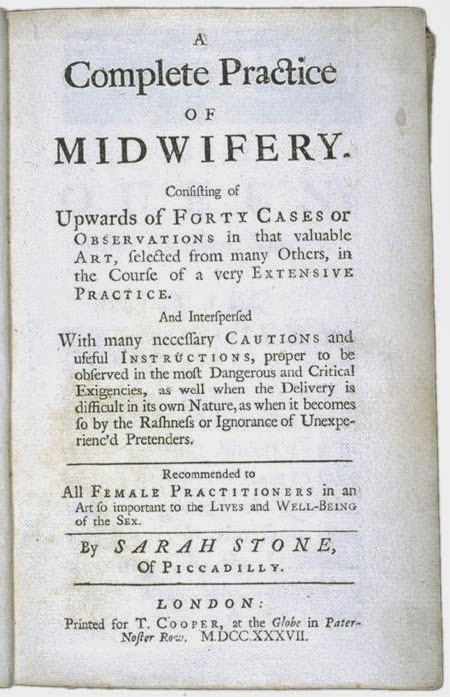 I know I have also been a bit lazy in my legendary midwife collection too - so today I'm going to go old school and talk about Sarah Stone. Firstly, in an age when most midwives learned on the job, she was an educated woman. She schooled herself in anatomy, attended autopsies, and wrote a book called A Complete Practice of Midwifery where she gave detailed instructions on how to deal with all manner of difficult birth scenarios. Sarah was more exceptional though for her strong opposition to the rise of the "man-midwife". These men became fashionable after the Queen of France was attended by one and soon became the must have accessory for the pregnant dandy around town. Can women be dandies? Sorry Quaintrelle - there you go, word for the day. These new breed of birth attendants were 'medically trained' (in the loosest sense of the word, we're talking advanced butchery rather than the sort of skills a student doc might learn today!) and there was a growing trend of them attending the latter stages of birth when they would produce a baby - like a rabbit from a hat - and "command all the praise" that was due the midwives. Now, I just have to say this. Sarah, how right you were! They were called men-midwives in your day, now we call them consultants. Same deal. These men were "well versed" in the use of things like the new finagled forceps, while people like Sarah had instead built up a lifetime of experience in working with the women to realign their babies during labour. She argued long and hard that what was needed was better education to support the practical knowledge of existing midwives, not the creation of a new strain of attendant. Unfortunately her words of warning were not heeded and her prediction that man-midwives would increasingly be the first port of call was, in time, proven correct.